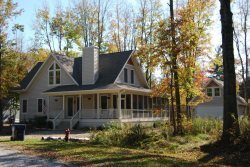 Located just 2 blocks from Lake Michigan, Peony Place is one of 2 side-by-side 2BR/1BA, dog friendly cottages located on a large private property in Lakeside, MI. Peony Place is an authentic, Pure Michigan cottage with an old fashioned garden on three sides and wooded area on the fourth. It is a perfect getaway for a couple or a small family. Additionally, well behaved dogs are welcome. With an open concept floor plan, nautical decor, comfortable furnishings, and even a wall clock that runs slow, guests will not be able to resist slowing down themselves in its relaxing environment. The main living area includes a fully equipped kitchen (sans dishwasher), a large living room with comfy couch and chairs situated around the fireplace and a dining area with a dining table with seating for 4. Guests enter the home through the screened in porch which is furnished with a rustic wood table and a cafe table perfect for outdoor eating. Two bedrooms, one with a queen bed and one with a twin over twin bunk bed, and a full bathroom complete this cozy cottage. Amenities include washer and dryer in a common area, central AC, flat screen TV, croquet set, hammock, and a large grassy yard. With its central location guest are just a short drive from numerous restaurants, shops, and nature trails located in the surrounding communities. Next to Peony Place is another 2BR/1BA, dog friendly cottage called Hydrangea Hideaway. These cottages are gems. They are available for rent separately for couples or small families or together for a great family compound. Click here for more information on Hydrangea Hideaway. We loved it and hope to be back! Loved the cottage. It was very comforable. I especially appreciate the comfortable sofa and bed, sometimes lacking in rentals. Well maintained and cutely decorated. Located in fairly close to beach. We brought our bikes and buggy, which made the commute back and forth very easily. Walking would have been just a little far for going back and forth, but not terrible. The public beach access was very nice considering. It was not very crowded, except on Sunday. Had a great visit. We would defiantly stay again.